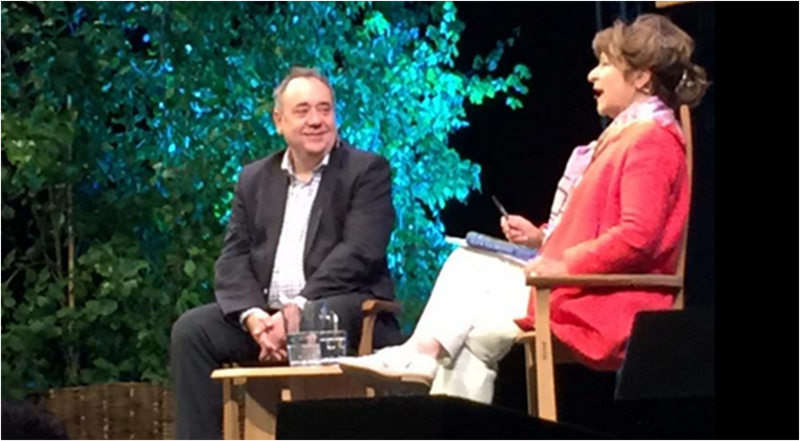 On the final day of the 2015 Hay Festival, Alex Salmond the former leader of the SNP and newly elected Westminster MP talks to Helena Kennedy QC the barrister, broadcaster, and Labour member of the House of Lords. Salmond is here to discuss the inside story of the campaign for Scottish independence, in his diary, ‘The Dream Shall Never Die: 100 Days That Changed Scotland Forever’. Kennedy asks how he became a campaigning Scottish Nationalist. At St Andrews university he had girlfriend who was secretary of the Labour Club and they used to fight about politics. One day she said; “if you feel like that go and join the bloody SNP” and he did the very next day. In those days you couldn’t join on a website. Salmond hitchhiked to Dundee to join the party, only to be given an address in St Andrews where he had just come from. In the Scottish referendum people got drawn into the political process and it made them better people says Salmond, 98% of the population registered to vote. He tells a story of people registering to vote for the first time since they opposed the poll tax. “Hundreds of thousands of people who had never given a stuff about politics or politicians were determined to exercise their democratic franchise. That’s what happened to lots of people in the referendum campaign and that’s what dictated the result of the general election campaign in Scotland. Meera Syal is in Hay to talk about her third novel and her first book in 16 years, ‘The House of Hidden Mothers’. She just didn’t have a book that she wanted to write during that time and until she was watching a documentary about surrogacy in India. It was as if one of her favourite books, Margaret Atwood’s ‘The Handmaid’s Tale’ had crossed the line from fiction into fact. The surrogacy industry in India is now worth $4.5 billion a year, and often poor girls from rural areas carry babies for wealthy foreign couples. In Meera’s new novel, Shyama, at 48 (in the first draft she was 44) has fallen for a younger man, Toby, and they want a child. She already has a 19 year-old daughter and has been told that she can’t have another child. Her friend Priya tells her about ART – Assisted Reproductive Technology. At the same time in a rural village in India, young Mala is trapped in an oppressive marriage and needs money to escape from her situation..
Manzoor says asks whether the novel about a relationship between two people is also about the relationship between England and India and Syal agrees. This isn’t too far from call centres,”effectively we’ve outsourced fertility”. The West has rich infertile women and the East has poor fertile women and trade has stepped in. “It hits you in your soul rather than your head. I love them” says Adrian Edmondson. On Wednesday night The Unthanks did just that with an astounding set in the Telegraph tent. From the very first song, Hawthorn, they were mesmerising. Both Rachel and Becky Unthank have pure haunting, soulful voices which blended with the exquisite trumpet playing of Victoria Rule of The Amadè Players. The music is sweet but also dark. “You had the choice tonight between the misery of Jack Dee, or the deep, deep misery of The Unthanks” said pianist and the group’s manager Adrian McNally, “you people need to take a long hard look at yourselves.” The songs are powerful and the exceptional voices are coupled with fine musicianship including Niopha Keegan on violin and backing vocals with Chris Price on bass. The new album ‘Mount the Air’ is available now – you can order it here.